Ta-Duh! The Residence at River House! Did Daniel Craig Do It in Spilsby? Thirty-year old Mister Hemsworth—six-foot-four with a tussled, Fabio-like blond mane and the pumped body of a gym-going superhero—and multi-lingual Miz Pataky purchased the approximately one acre spread from Crocodile Dundee star Paul Hogan and his Julliard-trained former actress wife, Linda Kozlowski. The Hogan-Kozlowskis purchased the property in July 2012 for $3.8 million, shortly after they settled confidentially with the Australian tax authorities who claimed they and Mister Hogan's former manager owed more than $150 million in back taxes. Yikes! During their brief ownership the couple made a number of mostly cosmetic but no-doubt viciously costly alterations to the house—i.e. they painted a bunch and did over the master bathroom, which had already had its interiors completely redone in a modern manner by the people they bought it from. Seven months later they caught a case of The Celebrity Real Estate Fickle and flipped it back on the market with an sking price of $5,250,000. 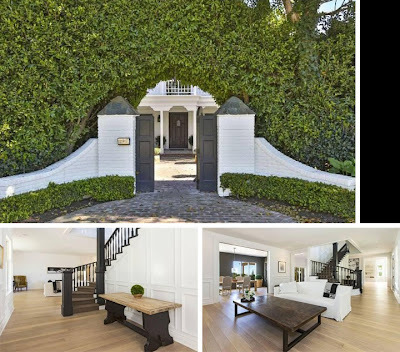 Listing information from the time of the transaction show the existing, three-story residence, all but hidden behind secured gates and a towering wall of hedges, was built in 1992 in a Victorian-style that hides and belies open, airy, and decidedly contemporary interiors. Spendy and downright stunning wide plank white oak floors run throughout the not exactly open concept but certainly interconnected main floor living spaces that include a "formal" living room with fireplace and a small adjoining vestibule tucked behind the staircase that connects to a trellis-shaded brick terrace that runs along the backside of the house. Pocket doors divide the living room from the formal dining room where Mister and Missus Hogan—and or their team of stager/decorators—covered the walls in an a steely and sophisticated greenish-gray that makes Your Mama wish we had a dining room painted a steely and sophisticated greenish-gray. Things veer towards the dramatic in the center island eat-in kitchen where the cabinetry and steeply peaked double-height vaulted ceiling appear to be painted with the same steely and sophisticated greenish-gray hue as was splashed on the walls in the dining room. 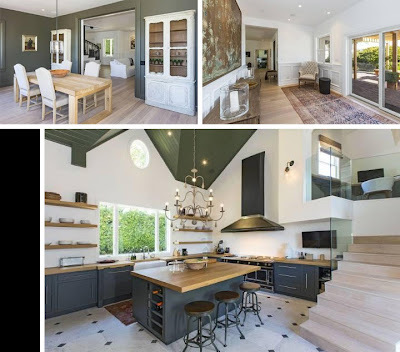 Listing photos show an inlaid marble floor, thick slab butcher block counter tops, open shelving for convenient access and display of daily-use tableware, and a farmhouse-y white porcelain apron sink. The top-grade appliances include a double-wide range (and hood) imported from France that Your Mama can assure the children likely cost more than the car y'alls cleaning lady drives. In a compact breakfast area there's a tiny corner fireplace and transom-topped glass doors that slide open to a red brick dining terrace. A glass-railed staircase angles up to a glass-railed study loft with built-in desk and cabinetry that overlooks the kitchen. There's another garret-office one more floor above although, to be honest, we're not exactly show how one accesses it. Nearby the kitchen there's a sunny and spacious den/family room with two bay windows, one perfectly suited to accommodate a round table for casual meals or—heaven forfend—a poker table. One long wall is anchored by an unadorned, over-sized firebox that's flanked by floating shelves for displaying shells, rocks, and driftwood gathered up during misty morning beach walks. More sliding glass doors lead from the den/family room out to the aforementioned trellised red brick terrace that overlooks the down-sloping, terraced backyard. Much to Your Mama's surprise (and chagrin), the property does not have—or, at least, did not have at the time of Mister and Missus Hemsworths' purchase—a swimming pool. There are, in fact, two good-sized flat sections of lawn in the terraced backyard that appear well-suited to a swimming pool, spa, and lounge area, particularly the lower lawn area. Call Your Mama an uptight old fart—and we've been called way worse, buttercups—but for 4.8 million clams Your Mama doesn't really care to go through the protracted and attention requiring hassle—not to mention expense—of designing, obtaining proper approvals and permits, and enduring construction set backs to install a brand new swimming pool, spa and lounge area. But, of course, lads and lassies, our whining is beyond moot since neither are Your Mama and The Dr. Cooter in in the market for a $4.8 million dollar house in Malibu (or anywhere else) and the lack of a cement pond was not—uh, duh—a deal breaker for Mister Hemsworth and Miz Pataky. The second floor master suite is complete, according to digital marketing materials, with fireplace, separate sitting/dressing area, two fitted walk-in closets, and a private veranda with distant over-the-tree-tops view of the Pacific. The decent-sized but hardly gargantuan attached bathroom is freshly redone with double sinks set into a long floating cabinet, egg-shaped free-standing soaking tub, and a separate glassed-in shower enclosure. Listing details indicate there are additional three guest/family bedrooms with en suite facilities and a "bonus bedroom," whatever that is. A spindly staircase that starts in the center entry hall entry winds tightly up through an open, light-soaked volume all the way to the third floor where a wood-floored lounge area sits below a many-peaked vaulted ceiling. In addition to the handful of bedrooms and half dozen bathrooms in the main house, the compound-type—ahem—estate has a separate (but attached) and fully self-contained, two-story guest house outfitted in a similarly modern manner as the main house. Both the living room and the combo kitchen/dining room have wood floors and sliding glass doors that open to a private terrace and the bedroom is nestled, A-frame cabin-like into the steep pitch of the roof on the upper level. 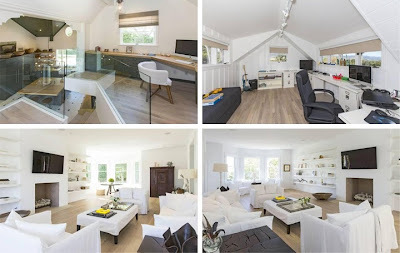 Your Mama has not even a whisper of a clue as to whether Mister Hemsworth and/or Miz Pataky own any additional property in Los Angeles, Spain, Australia, and/or the U.K. where they were spotted earlier this year with their infant baby popping in to a real estate brokerage in London's natty Knotting Hill. That doesn't mean they don't. Maybe they're secret real estate ballers with property portfolio that would make most millionaires squirm with envy. (We doubt it, but it's possible, right?) . We also aren't completely sure what's become of the Hogan-Kozlowskis although good-ol' Yolanda did turn up some circumstantial and entirely unsubstantiated evidence they might have purchased a much more expensive home in the Mandeville Canyon area. Might we said. Did you hear that? Might. *Technically, the property was purchased, as per property records, in mid-June (2013) via a trust that obscures the identity of the owner but guns-always-blazing real estate yenta Yolanda Yakketyyak swears on her impeccably maintained 1984 Jaguar XJS that the buyer is Australian-born Chris Hemsworth and his Spanish wife, Elsa Pataky. **Imagine for a minute, children, how that conversation went down with whatever previous homeowner was responsible for the most recent remodel of the house and whatever household help they put up in that separate and clearly not equal staff suite down by the garage. "Oh, middle-aged Guyanese au pair, we know you've spent 23 hours a day the last 12 years raising our children and teaching them French but we just do not currently have the resources to remodel the massive main house, overhaul the sizable guest house, and do over your little lean-to down by the garage. But, seriously, like, you know, we really do think of you as part of the family, right? So we'll try to get to that next year. Okay, hun? Great. Right. Okay...Well, I better get going or I'm going to be late to yoga. " Boy, they sure grow them Hemsworth boys purty, don't they? From the air, the house has an interesting roof-scape; too bad it hovers over, what Our Mama so aptly discoursed upon, an rather schizophrenic interior. And the exterior façades look like a government committee's idea of Victorian -- and don't get me started on the cramped, wedge-shaped lot. Remove some of the faux gingerbread and ersatz towers & you might wind up with a passably palatable, over-priced contemporary with no pool about a mile from the beach. Loving the whole hedged and gated entry vibe, and the staircase has me all a-tingle. That goes in the architectural spank bank for sure. At least we know you-know-who won't be licking the fixtures. Love the ultra-prvate hedged entryway as well. Great for keeping unwelcome large-tongued guests (M.C.) at bay. There are many swoon-worthy elements and architectural interests in this home, but I'm with Mama -- all struggling for harmony under one roof? Not so much. When I look at these please poke my eyes out now -- exteriors with convulsing roof pitches, afterthought windows and the little WTF place next door, this outside money shot seem like putting a cherry on top. 4.8 million for THAT ? Whaaaahahhhaaaaahhhhaaaaa ! Who's so stupid I ask ? Dare I say there seem to be plenty out there. Oh and Mumsy, time to delete the spammers who are invading your comments with their grammatically bad, annoying ads about nonsense. Nicely put, Steve; although I, like Mama, do like that particular shade of greenish-gray, there's simply too much of it, and it appears to have been applied with little rhyme or reason. The hedged gate is a nice tableau Bentley, but unless you're trying to downsize the family I see little charm in either staircase; I fear for the young ones barreling down the main one & flipping themselves over the odd curve at the bottom (just doesn't work for me), or launching themselves onto the overly-typical mortuary slab island in the kitchen from the railing-free stairs there.